do you chill this before you put your wine in it? BEST ANSWER: The Vinglace Wine Chiller should be used with a chilled bottle of wine inserted into it. The chiller keeps the bottle at the temperature it starts at. Does this hold today's 750ml champagne bottles which are wider than the traditional champagne bottles? 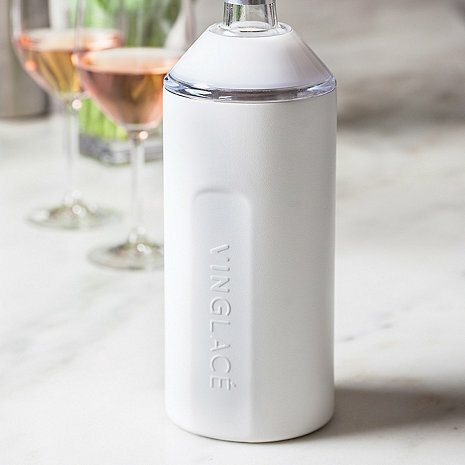 BEST ANSWER: The VinGlace Wine Chiller (White) can accommodate most champagne bottles but Dom Pérignon and Korbel bottles are just a little too wide for this chiller. The packaging is amazing and it's a beautiful product! It works beyond expectations!!! The real deal, couldn’t believe how long it kept the chill on the wine.